To make things easier for you wonderful cheese lovers, we've put our most popular cheeses in one box to save you selecting each one individually. Enjoy these beauties! Petit Valencay - a lovely French, ash covered goats cheese in truncated pyramid shape. When young, it's light and fluffy with a lemony flavour but then growing more nutty and distinctly goaty when mature. A smaller version of 'Valencay'. Black Bomber - an extra mature cheddar from Snowdonia, Wales. It often doesn't get the credit it deserves when people talk about good cheddars but this has a moist, creamy texture due to the wax coating and a lovely tangy taste with a satisfying maturity. Carboncino - simply irresistable, mixed milk cheese from Piedmont, Italy. Cow, sheep and goats milk together to produce this soft, gooey delight. 'Carboncino' means 'little ash' in Italian as this beautiful disc of cheese has an ash coating to protect the 'paste' within. 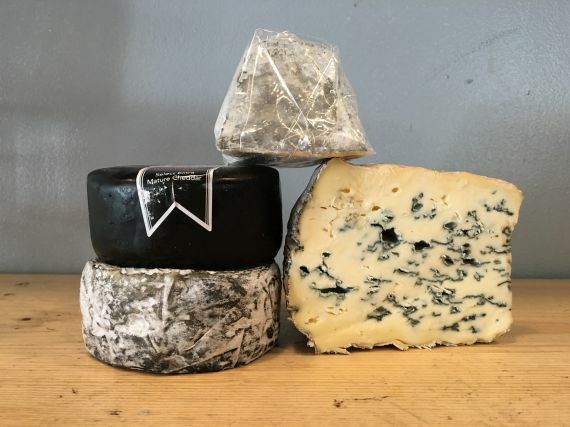 Perl Las - a beautiful organic blue cheese from West Wales. Creamy and slightly sweet with just the right amount of blue. Once you start it's hard to stop and this is a great addition to a cheeseboard as the blue and creamy colours look superb together. So there you have it, our most popular cheeses in one handy box delivered to your door! Don't say we're not good to you. This would make an ideal gift for cheese lovers.